A light-bulb memory of a moment which revealed the real me to others — and to myself. 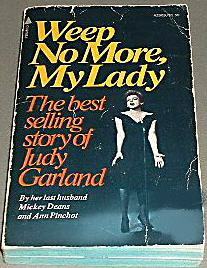 Rummaging through a box of books in the garage one day when I was 12 years old, I stumbled across a copy of the paperback edition of ‘Weep No More, My Lady,’* a biography of Judy Garland. Several forces drew me to the book, not the least of which were the drama of the cover photo and the melodrama of the title. Upon sighting the found treasure, a little gay gene in my homo-adolescent brain shouted “Judy Garland, YES!! !” I had to read it. At twelve I was by no means the Judy fanatic I would one day grow to be, though of course I knew Dorothy Gale from ‘The Wizard of Oz.’ I had seen Judy a few times on the ‘Mike Douglas Show’ and ‘Merv Griffin’ and loved her self-deprecating wit and boozy charm. I’m sure there must have been a Judy album or two in amongst the hundreds of LP records my mother collected, though I honestly don’t remember listening to Judy Garland at that age. Whatever the driving force was, I carried the book off to my room to feed my burning curiosity. 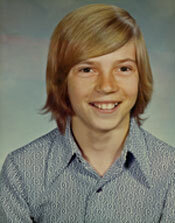 If you can picture my bedroom circa 1974, it was 1970s-fabu and completely decorated by yours truly. I was immensely interested in interior design then and used money I made babysitting to outfit my teen bachelor pad. One afternoon while my brother was out tossing a football with the neighbors and my 4-year-old sister was off playing, I was sequestered in my room drinking hot tea (that’s what I kept in the mini bar) and reading tidbits about Judy’s career and her final months with her handsome 35-year-old husband whose job was promoting disco night clubs. Someone gave a courtesy knock while simultaneously opening the door. It was Dad. “You’re reading it because your mother read it,” he says, which I took to be an indictment of the utter lack of masculinity attached to a biography of Judy Garland. In that moment, I quickly surmised that I had been “found out.” As what, I wasn’t entirely sure, but I had a pretty good idea. “I guess I’m just interested in it,” was all I could finally get out. With that, Dad turned around, walked out and shut the door, completely dropping the original and unknown reason for his visit. As if my bedroom decor wasn’t signal enough, I now see that my reading a biography of Judy Garland in 1974 at the age of twelve sent my dad’s gaydar off the dial. 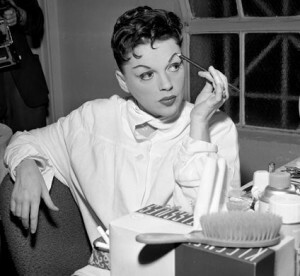 That day, while the boys on the street were playing football, I was was being outed by Judy Garland. Note: A version of this story was previously published on the author’s former blog, Worth Repeating. This was quite high-larious. I think my father must have given me the same look when I, by the age of 7 had the entire Funny Girl soundtrack memorized. Running around singing “Sadie, Sadie, married lady” must have set off some red flags, or rather, some rainbow flags. 🙂 Can’t wait to read more wee articles by you. Ken, I’m all smiles. Thank you! A slightly different story of mine from 1958. It was nearing New Year’s at the Grand Hotel in Calcutta where we were visiting my father whose business kept him in India most of my childhood. Picture the grand dining room, an entertainer, live music, and the song “Volare”. Oh, oh! Did I LOVE that song and that SINGER! 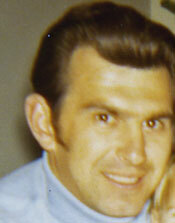 I would sneak down from the room in my pj’s to sit in my mother’s or father’s laps for a few minutes as they sipped their cocktails, smoked their strong cigarettes and giggled with their tablemates. And the vocalist was a dream. I was rewarded with a short visit, then sent lovingly back to the room. On a subsequent day, I overheard the men commenting on the singer and use the word “homosexual”. Perking up my 8-year-old ears, I asked my mother what a “homosexual” was. Without uttering a word, she whisked me aside into a corner of the lobby screened by some potted palms to discuss this question with me. I have no memory of what she said, but the graceful significance she gave to the moment, the opportunity to bond with me in the depths of this question, which she could not, of course, really answer effectively to an 8-year-old…her swift attention told it all. Unfortunately, she died when I was 12, and it certainly wasn’t rosy with the remaining males in my family after that. But that moment is riveting…and whenever I hear a few bars of Volare, I am drawn into that secluded corner and its secret conversation. hi ken, love the story. as everything, in eastern europe it is usually a bit different and less subtle.